I'm sure everybody in the Rio Grande Valley knows by now that circles are out and stripes are in. Most of the Circle K stores in the RGV are being renamed to Stripes. 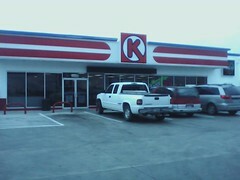 I thought I would capture a picture of one of the Circle K stores before the change. This is one of my favorites. It is at the corner of 10th Street and Hwy 107. I usually stay away from the Circle K stores that don't offer tacos; those are inconvenient. They make you stop for nothing. Another good thing that can be said about Circle K stores is that they often have fountain drinks on special during the summer. For about $1, you can walk out with a half-gallon beverage to quench your thirst. I hope that nothing changes under the new Stripes name. How to Get a Free Car! Great Product Improvements from Yahoo!